I tried to hit these from all angles: the idea of different cultures having different kinds of tattoos, thievish counterculture, beautiful but mysterious designs, and even punitive marks given to you by the man. Unless otherwise noted, each tattoo requires 100gp per player level as well as the blood of a creature equal in HD to your level to be added to the ink. Also, you need someone with the appropriate knowledge to ink you (possibly breaking their culture's taboos). 1. Widow Tattoo - When you die, this will bring you back to life by drawing hit points from surrounding friends. It will drain as many as needed to bring you to full health. This happens once, then the tattoo disappears. These hit points are lost permanently by those drained. 2. Clan Name Scar - The name of a wizard raised in your skin prevents them from charming you. 3. Clan Saga - The marriages, births, and deaths of your clan/tribe are scarified into your skin. Once a day you can raise your Strength by one for each living warrior listed, or your Wisdom for each living elder listed. 4. Clan Marks - Usually hash marks or rings around limbs. Each member of the clan, tribe, or village supports your quest and acknowledges it by tattooing or branding these marks on you themselves. Each mark gives you an additional 1hp. The marks disappear as they are lost. 5. Ghost Killer - False Heart - Usually a stylized heart. Requires an additional 1gp per xp and it then protects those xp from being drained away. 6. Ghost Killer - Flower Shroud - Usually flowers blossoming around a stylized image of the dead. Your choose which type of undead or demon is represented. Each session of play a new tattoo flower blooms, and sometime during each session you will be attacked by 1d6 of that particular undead or demon. If you survive the third flower blossoming, you'll have permanent Sanctuary effect against those monsters. 7. Ghost Killer - Spirit Net - Usually stylized nets. Requires the blood of a creature that can become immaterial or teleport. Any creature that tries to do so within sight must save or be captured in the tattoo. You can have only 1 captured creature per level. Rumor says the foul beasts are released on the your death. 8. Elven Bridal Patterns - Usually delicate depictions of animals and foliage. Meant for the human brides of elves, each tattoo prevents any aging for 10 years, then fades away and allows aging as normal. 9. Dwarven Diagrams - Usually boxes within boxes tattooed on forearms. Can depict the complex paths to Dwarven inner sanctums or plans for building constructs. Only granted to those that prove themselves Dwarf Friend. 10. Guild pectoral - Each successful job you pull adds more ink, fifth job finishes it. Your sense of self, and what you've accomplished is so strong nothing can take possession of you any more. 12. Guild Sleeves - Given for stealing from rival guilds, two means you fall like a feather. 13. Guild Psaltery - Usually encoded images that have meaning to those in the criminal underworld. Adds a bonus to all thief skills or saves. Killing someone with a Psaltery of their own will add it to yours. The bonuses are additive. 14. 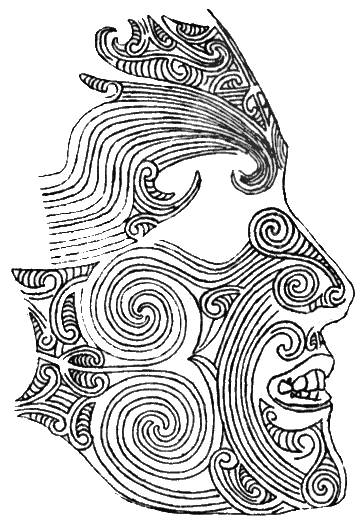 Fierce Moko - These patterns chiseled on the face will give any foes -2 to any morale checks. 15. Gypsy Mirror - Once a session this tattoo will change to depict something in the future. 16. Contingent Sigil - Allows for a spell to be inscribed into the skin that will be set off when the chosen conditions trigger it. Requires a wizard that can cast the spell. Spell must affect your person (Feather Fall ect.). 17. Hidden Arcana - Some wizards will pay you to be tattooed with secret lore to keep it in an unexpected place. Choose an unlucky number and if you roll that in combat the wizard has decided to cast that spell, burning it off your skin for damage equal to their hit points in level. 18. Beautiful Spell - An elegant, full-color work depicting the finest translation possible of a particular spell (bonuses to caster). It makes you immune to the spell but draws wizards once per session wanting to study you and usually flay it off you. 19. Liars Marks - Often inked on those sent on Church, or otherwise important, missions. If any of a set of 12 proscribed actions are committed, a black mark will appear on your torso for each. 20. Apostate Stigmata - Given to people as a lesson. They prevent you from entering a particular place- Temple, City, Plaza. If you are physically forced to enter you take 2d6 points of damage each round you remain. Some of these mechanics have appeared on the blog before (1 here, 3 here, 4 here) but I think they might work well as tattoos and wanted to put them all in one place. Number 6 was inspired by the great stuff going on over at the Swordfish islands. I'm not sure about the power level of some of these, but you might make them hennaed designs that fade in 3 sessions and have them still be something players would be interested in getting. These are going to be printed out and stuck between the pages of the tattoo parlor in City Book I. Thanks! There are many kinds of tattoos are available according to people choice. People get tattoos to show their emotions and feelings. These are twenty tattoos idea which given here are nice and appreciable. Thanks. Yeah, pc tattoos are a great. I had one player whose fighter got a 3-d tattoo of a unicorn on his forehead. I guess a more correct title for this post would be 20 magical tattoos with interesting mechanics.